A few weeks ago, Brian Cashman told Joel Sherman that the Yankees are looking to add two relievers this off-season. That makes quite a bit of sense, considering that two of the team’s biggest name relievers in Zach Britton and David Robertson hit the free agent market; moreover, the league-wide increase in reliance upon the bullpen all but began in New York, meaning this is nothing new. And, luckily, there are plenty of quality arms on the market to reinforce the arms at Aaron Boone’s disposal. We will eventually get to the majority of the high-end relief options on the market (barring players signing before we have the chance to get to them), though we will avoid the players that are locks to secure a closing role and, therefore, closer money. And I’ll kick-start that effort today by taking a look at two of the highest-ceiling commodities on the market, that just so happened to battle injuries last year. The 28-year-old Herrera was a member of the vaunted Royals bullpen that helped them reach back-to-back World Series in 2014 and 2015, throwing a combined 139.2 innings of 2.06 ERA ball in the regular season. And he was even better in the playoffs, pitching to a microscopic 1.26 ERA in 28.2 postseason innings. He hasn’t quite pitched at that level since, but a 3.18 ERA (138 ERA+) over the last three years is still quite good, to say the least. And we also know that he was battling an undisclosed shoulder injury – referred to as ‘tightness’ – whilst in our nation’s capital. It seems as if health was the issue. That’s encouraging, even if it’s off flat ground and at way less than maximum effort. With all that in mind, what will he cost? MLBTR projects a one-year, $9 MM pillow contract for Herrera; Jim Bowden predicts a similar deal, albeit for $11 MM. And, unless he proves to be completely healthy or teams believe that he’ll be ready for a full Spring Training, I think that makes sense. And he wasn’t eligible for the qualifying offer due to being dealt in-season, so there’s no hidden cost, either. So does he make sense for the Yankees? I think so, especially if it’s a one-year deal. He has a terrific track record, and he was great before his shoulder started barking last year. The flyball tendencies that he developed in 2018 aren’t great – but it didn’t hurt Chad Green or Jonathan Holder or Adam Warren last year. A healthy Herrera should be expected to thrive in any environment. 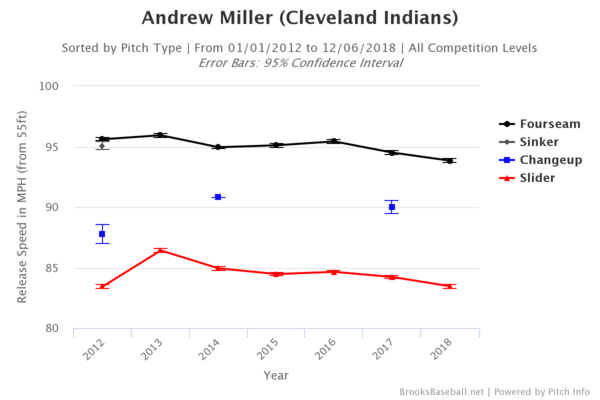 On the off-chance that you need a refresher, Miller was arguably the most dominant reliever in baseball from 2013 through 2017, pitching to a 1.82 ERA (234 ERA+) in 291.2 IP. 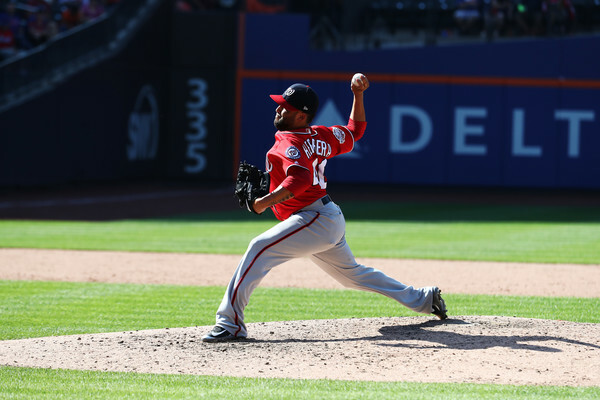 That 1.82 ERA ranked third among all relievers in baseball in that stretch, and his 291.2 IP ranked 30th. Add in a ludicrous 41.1 K% (2nd) and 33.7 K-BB% (2nd), and … well … what more needs to be said? Unfortunately, Miller was awfully mortal in 2018. And it was largely due to the fact that he hit the disabled list three times – once with a hamstring strain, then with inflammation in his right knee, and then a left shoulder impingement. None of those are encouraging for any pitcher, yet all feel even more worrisome for a gigantic pitcher that’ll turn 34 in May. This graph captures his career since shifting to the bullpen full-time in 2012. 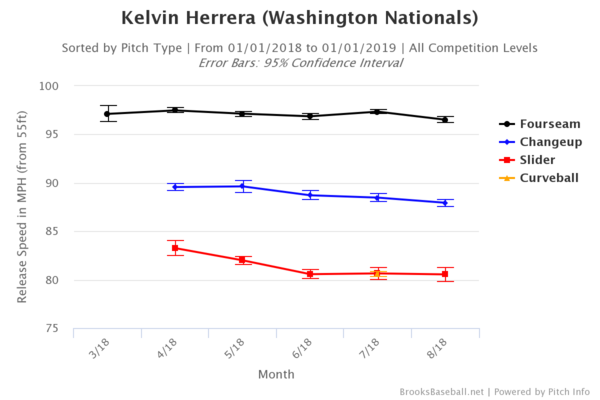 His fastball and slider has been relatively steady over the last few years, and then dropped off by nearly a full tick in 2018. That’s not uncommon for a pitcher entering his mid-30s, nor is it the sort of drop-off that makes him unpitchable – especially as a southpaw. It’s still not something that you ever want to see, though, particularly in an abrupt manner. There is a silver lining in the form of his pre-injury performance, though. 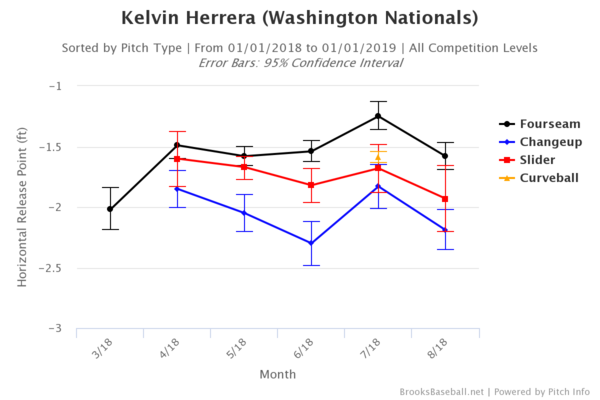 It was an incredibly small sample size, but Miller posted the following line before tweaking his hamstring: 10 IP, 6 H, 0 R, 4 BB (1 IBB), 17 K. Moreover, his velocity was at its high point of the season, which isn’t too common. The walks are high, but outside of that he looked like prime Miller. It’s improbable that the team that signs Miller will see his prime form, but I do think that there enough positive signs to suggest that he will be better than he was last year. 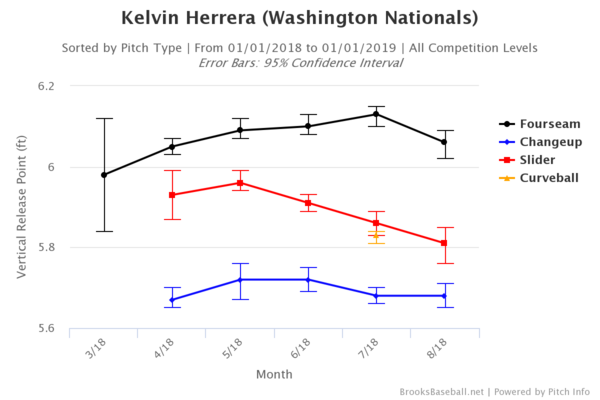 His strikeout rate was still comfortably above average, as was his groundball rate, and he was healthy and effective after returning from his shoulder injury. And, unlike Herrera, he healthy at this point in time. There’s more of a disconnect with projections of Miller’s contract as a result of all of this. MLBTR sees him garnering a 3-year, $27 MM deal, whereas Bowden predicts a one-year, $10 MM pillow contract. I’d love the latter; I’m not too sure how I feel about the former. 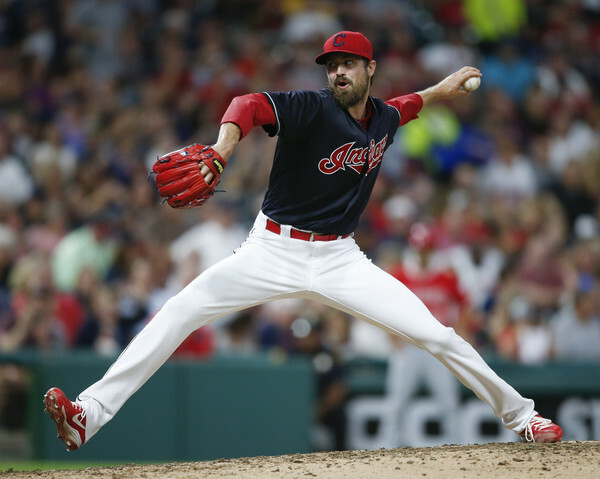 Cleveland didn’t extend Miller the qualifying offer, so his sole cost will be straight cash. I think Miller makes more sense for the Yankees, due to the greater certainty of his current health, his familiarity with the park and organization, and his handedness. But I don’t think a 3-year deal makes a tremendous amount of sense, given the team’s budget (whatever it may be) and the glut of solid relievers on the market. One year? I’m all-in. Two years? I’m a bit apprehensive, but I’d probably do it. Three years? Only if that last year is a team or vesting option. And that’s tough for me to say, as Miller remains one of my favorite pitchers in the game.